Meat consumers are experiencing label overload. From grass-fed “this” to non-GMO “that,” it’s easy to become overwhelmed by the rows of bold letters and even bolder claims at the meat case. Not only are brands required to stand out, they also need to evoke a brand identity, tell a brand story, establish credibility AND state specifications. That’s a lot to accomplish in a single store visit – a place where shoppers want to quickly find their items and check out. When Midan teamed up with Tyson Fresh Meats, Inc. to develop the Open Prairie Natural Meats brand, we worked hard to lay the groundwork for a strong brand, complete with a brightly colored logo, fitting name and product specifications that compete with products of the same category. Then it was time to spread the word and encourage consumer buy-in. We looked to the digital space for a direct line of communication with natural consumers, a segment of shoppers eager to learn about the food on their plates. What better way to reach them than in the palm of their hands? To set ourselves up for success we hit the books. Our account management and customer insights teams studied consumer trends to identify what our message should say, where it should live and who was listening. With the goal of educating natural consumers to support brand consideration and sales, we created an integrated digital marketing strategy. It’s no longer enough for websites to just be flashy and cool. They must create a positive user experience that encourages deeper investigation and further interaction. A website is where users go to learn more about a brand, but also engage with it. 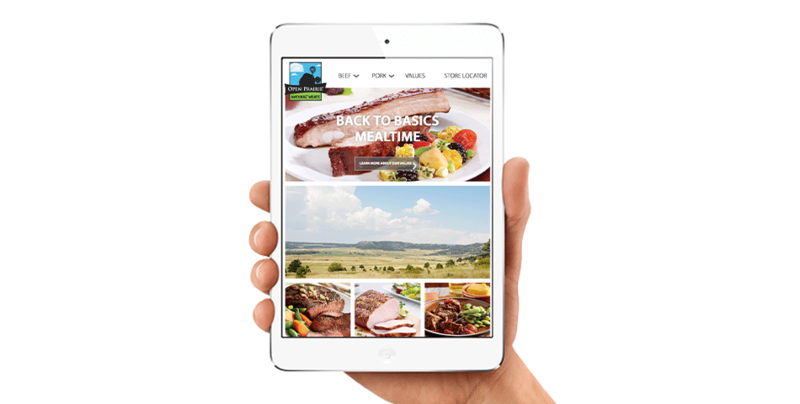 To tell the Open Prairie Natural Meats brand story, we designed an easily navigable website to house compelling content that drives consideration. FAQ pages helped to clear confusion about all things “natural” while videos of rancher partners established transparency. By creating a hub of diverse content, we provided our target audience with insightful information that met their needs and supported sales goals. Through brand persona research, we learned that our target audience was more likely to use Facebook than other social media platforms. We also learned the types of content they were scrolling for and the kind of voice that would resonate best. This knowledge helped us gain strong footing in the social space with a consistent posting schedule that aligned with the brand and drove traffic to the website. To continue the momentum, we employed regular testing and reporting to find the sweet spot of follower engagement. In a space saturated by viral videos and gripping headlines, did consumers really want to learn about product specifications? Yes! Results from A/B testing confirmed that ad copy stating the specs provided a 19% higher click-through rate than ads that did not. Keeping a close eye on the numbers helped inform creative development and targeting parameters to guarantee the right message was served to the right audience. From this, we saw an 82% increase in average quarterly engagement rate from Q1 2017 to Q2 2018. “Google” is not just a noun – it’s a verb. People are accustomed to asking the internet questions and receiving answers instantly. When consumers asked about “natural meat,” we wanted them to find Open Prairie Natural Meats. To improve the visibility of our website on the internet, we used paid tactics to drive traffic. Pay-per-click advertising allowed us to reach consumers in locations where product was sold while they searched for relevant terms. Due to the competitive nature of organic and natural meat markets, we got creative with keywords to ensure our ads were being seen more frequently and at the top of search engine results pages. Using consumer research to understand search behavior and language, we increased new website sessions by 97% from Q1 2017 to Q1 2018. The digital efforts paid off! Average quarterly engagement increased 82% and new website sessions exploded, nearly doubling!